Portstewart’s Lee Forgrave got his New Year off to a flying start when he hit home in the opening minutes of Portstewart’s first game of 2015, as they entertained Pat McAllister’s Sport and Leisure. Visiting spectators were treated to a thrilling encounter at a wintry Seahaven, as Sport and Leisure bombard the Portstewart defence, but could only walk away with a share of the spoils. Kevin Lynch should have equalised for the visitors in the opening minutes however his spot kick was saved by Madison in the Ports goal. Attempts from Lynch, Tully and Moore were dealt with by the Ports defence whildst at the other end Doherty made some good runs into the box. Cunningham thought he had levelled the scored four minutes before the break, but his goal was ruled offside. Moments later and that same man did have his name on the score sheet as the half finished 1-1. Sport and Leisure started the second half as they had finished the first dominating play. Tully and Cunningham tested Madison, who was on fine form in the Ports goal. With eight minutes left on the clock, Portstewart were awarded a penalty after Garland handed in the box. Peden stepped up to the spot, only for his shot to be saved by Nugent. Sport and Leisure pushed for a winner. Madison pulled off two fine saves to keep his side in the tie. At the other end Doherty and Turner’s efforts didn’t test Nugent and the tie finished level. He praised keeper Joel Madison, describing his performance on Saturday as ‘superb’. “We sometimes take Joel for granted, he kept us in the tie making a number of really good saves. Describing his team as ‘rusty’ on Saturday, Taylor says he is hopeful of a better showing on Saturday when his side welcome Championship One club Dundela. “We hadn’t had any football for about three weeks, and only a few training sessions so we were rusty, there was no doubt about that. “We started well, but the long break between games showed, we were just missing so much, and players were started to get frustrated. “We know that Dundela will be no push over. “But we will put in a few hard training sessions this week to be sure we are up for the cup game. Taylor has boosted his squad with two new signings. 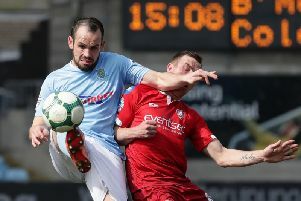 Former Ballymena United player Richard Vauls, who is the son of former Portstewart player Alan, and Letterkenny man Connor McCullough, are welcome additions to the Portstewart team. “Richard will be a good addition to the squad. “He is just coming back from an injury so he’s keen to get match fit and playing football again. I have no doubt that he will be snapped up by a Premiership Club, but before that we are very happy to have him in our team. “Conor started training will us at the start of the year having just moved to the area for work. He plays in midfield and has fitted in really well with the rest of the boys. Gary is hopeful that defender Luke Bradley will be fit again for Saturday. Stuart Millar remains sidelined due to suspension.